Only 6 more days until I am sipping Margarita's on the Florida Keys and only 10 more days until my only and older sister ties the knot! I have been working on my maid of honor speech, but am open to cute quotes, suggestions and/or ideas that anyone might have! Last month, I was nominated for the Liebster award FOUR times! Since it would take me eternity to answer all of your questions, I decided to post 20 interesting facts to get to know me better! Well, I hope that you learned something fun and interesting about me that you didn't already know! Be sure to check out the lovely ladies blogs above too! Totally agree about the pizza and bagels...substitue your BBQ sauce w/ some ranch and I'm set fo' life! WOW that MOH speech was painful. That was most definitely the most awkward MOH speech ever. Like as in I was cringing while watching it..
Oh my goodness, that speech was so awkward. I spent the whole time hoping it would end/wondering if it was a joke. Oh dear. 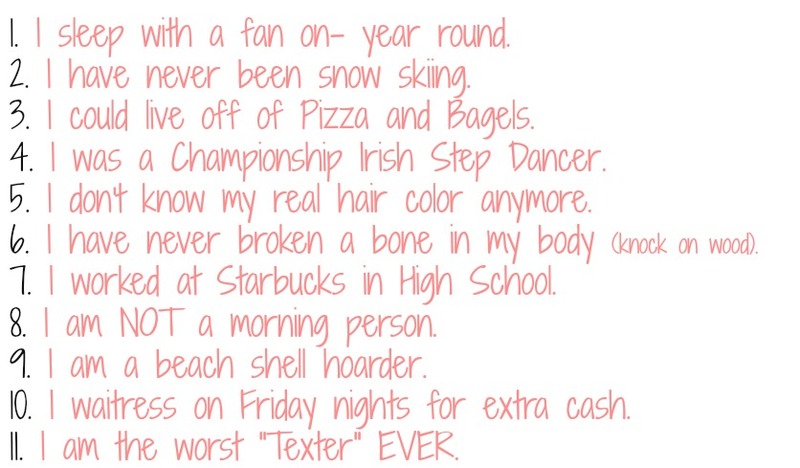 Number 13 is me in a nutshell too, hah! I just found your blog and I love it! congrats on your award!! Jealous you haven't broken a bone.